Welcome to Best Thing We Ate This Week, where each week, we'll have a special guest or Thrillist staff member talk about a New York dish they recently tried and loved. This week, author Stephanie Danler, whose novel Sweetbitter is based off her time working at Union Square Cafe, returns to her old stomping grounds for the gnocchi. But as Italian food authority Marcella Hazan reminds us in Essentials of Classic Italian Cooking, “Gastronomically speaking, gnocchi should be anything but lumpish." The ultimate goal is that they be “fluffy” and “cloud-light.” That holy grail of gnocchi is what I’m always looking for, and so rarely find. 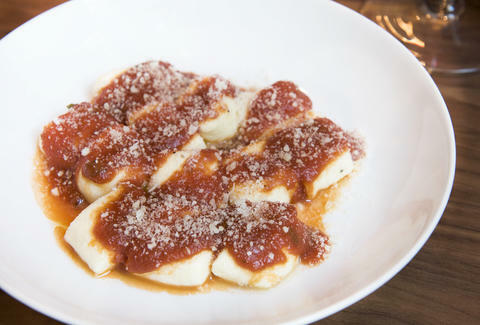 I was fortunate enough to be working at the old 16th St Union Square Cafe during the time that Chef Carmen Quagliata debuted his ricotta gnocchi. I remember assuming I knew what they would taste like, and my surprise at first bite. There was nothing tough or leaden about them. These pale pillows of barely-held-together ricotta and mascarpone melt instantly on your tongue. They come sauced with a concentrated, tomato passatina, sweet but bright, velvety, simple. In the decade since I worked at Union Square Cafe, it’s the one dish I order every time I dine. When I scored a lunch reservation at the new Union Square Cafe, I tried to keep my head clear of expectations. It’s no fun to play the comparison game, especially since I was so excited to see what Chef Quagliata was cooking. But when I saw the ricotta gnocchi, I exclaimed to my dining companion, ‘It’s still here!’ Which is my response to everything about that gorgeous lunch -- the atmosphere, the din, the flowers, the service, and the cloud-light gnocchi -- it’s all better than ever.